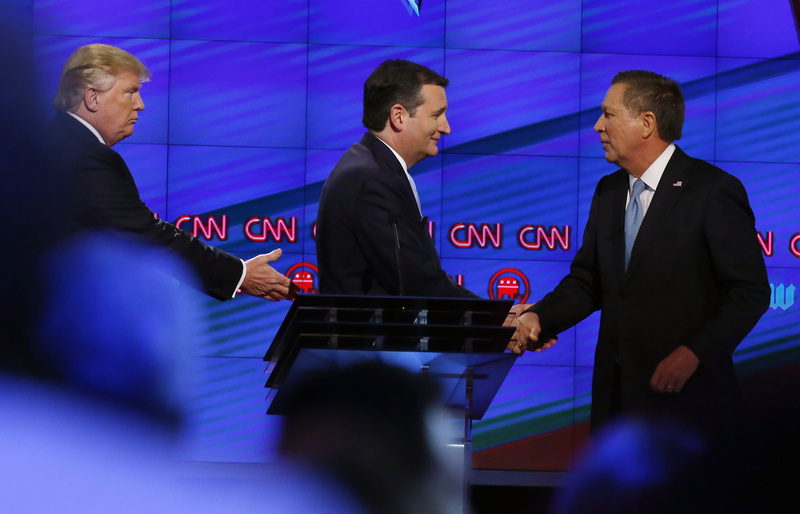 Will The Kasich-Cruz Alliance Work? In this week’s politics chat, we weigh the impact of the newly minted alliance between Ted Cruz and John Kasich against Donald Trump. The transcript below has been lightly edited. Like conquering European powers after a war — i.e., pretty much most of modern history, those bastards — the campaigns have decided to divide territory to maximize their spoils; Cruz will get Indiana, and Kasich has dibs on Oregon and New Mexico, presumably because he enjoys going to art fairs more than Cruz. Donald Trump, Ted Cruz and John Kasich after the CNN Republican presidential debate on March 10 in Miami. clare.malone (Clare Malone, senior political writer): I think it’s pretty darn big — signals what I’m thinking of as a Machiavellian turn in the race. Cruz and Kasich are realizing just how little time they have left and how steep the odds are; minus California, the states with lots of delegates up for grabs are dwindling away. harry (Harry Enten, senior political writer): Well, Cruz needed to do something. Indiana is a must-win state for him. It’s a state he was favored to win for a while, but the polls that came out late last week had him trailing Trump by single-digits. Those surveys all had Trump around 40 percent and Cruz+Kasich at 49 percent or more. There are 57 delegates at stake in Indiana, and if Cruz won the Cruz+Kasich share in the polls, he would get pretty much all those delegates (in Indiana, delegates are awarded winner-take-all on both the congressional district and statewide levels). Moreover, the states that Cruz ceded to Kasich (New Mexico and Oregon) have only 52 delegates between them, and those are awarded proportionally. The proportional rules mean that even if the Cruz+Kasich share of the vote is lower in those states because of this deal, it won’t cost them that many delegates. This is about Indiana and about stopping Trump. natesilver (Nate Silver, editor in chief): My question is whether you guys are looking at this too much in a vacuum. Yes, if you combined Cruz’s and Kasich’s support, Trump would probably lose Indiana. But as I wrote this weekend, the most important development of the past couple of weeks might be that Trump is successfully persuading Republicans that “the system is rigged,” or at least that he’s clearly going to win the plurality so they might as well get this over with. clare.malone: Are you wondering if the sheeple are going to follow this directive, Nate? natesilver: I think some of Kasich’s voters will follow it, yes. But I also think it could give Trump a good talking point and persuade some undecided Republicans to go with Trump. natesilver: Trump’s polling has gotten quite a bit better over the past two weeks. If the reason it’s gotten better is because voters have the sense that the rest of the party is colluding against him, this won’t necessarily help. harry: So what do you think Cruz and/or Kasich should do? Nothing? Trump is going to say the system is rigged anyway. Nothing has ever stopped Trump saying what he wants to say. natesilver: Well, there are a couple of alternatives. First, they could coordinate without making a big show about it. Kasich quietly pulls out of Indiana and has some pretense for why he’s spending time in Oregon or California instead. Maybe on the eve of the primary, he issues an ambiguous statement saying that he’d rather his voters go for Cruz than for Trump if they must. The other alternative is a unity ticket where Kasich runs as Cruz’s VP. clare.malone: Kasich is everyone’s safety school VP pick, huh? I actually think that quiet coordination wouldn’t have worked in this case — the atmosphere of this race is pretty pitched, and I think they wanted to send their voters a clear signal. harry: Did you consider this quiet — when Marco Rubio told his backers to vote for Kasich in Ohio? natesilver: The Rubio thing doesn’t seem like collusion as much, Harry. They played pretty coy until the end. Still, it worked! Rubio got only 2 percent of the vote in Ohio. harry: The Rubio folks stayed coy until about four days before Ohio. The Cruz-Kasich news broke nine days before Indiana. I’m not sure how big a difference that is. As for behind the scenes, I’m very hesitant to believe that voters are paying that much attention. I’m also not sure how much of a difference advertisements have made. natesilver: Let me say something else about Rubio, by the way. He was running as a candidate who could unite the whole Republican Party. Now that’s a difficult task, and he failed at it. But in some ways it made him a more credible #NeverTrump spokesperson. Cruz and Kasich themselves have run as factional candidates, meanwhile. Cruz has been moving to his right — hitting Trump on the North Carolina transgender bathroom law, for instance — instead of trying to persuade moderate conservatives in the Indianapolis suburbs to vote for him. micah: Clare, how receptive do you think Cruz and Kasich voters will be to this message? Do you think they’ll happily behave tactically? Will voters resent their favored candidate asking them to back someone else? clare.malone: I think at this point, my sense is that if you’re supporting Kasich or Cruz, there’s a good chance that you’re not necessarily in the thrall of them, you’re just against Trump. So I can see tactical voting working. Obviously Kasich had an inherent advantage in Ohio, but the many public statements telling voters to vote strategically had to have bolstered him a bit. micah: Has this type of collusion happened before? Wasn’t there an effort to block Jimmy Carter in 1976? harry: I don’t even think we need to go back to 1976. I think we can go back to 2008 and how John McCain and Mike Huckabee colluded in West Virginia to stop Mitt Romney from getting delegates. That’s not to the same scale as this Cruz-Kasich team-up, but this type of thing does happen in multicandidate primaries. clare.malone: This kind of stuff is happening this year at state conventions — Kentucky’s this weekend was basically just Mitch McConnell stuffing the slate of delegates to the national convention this summer with establishment types, and the names weren’t released until right before the vote. There’s TONS of collusion that’s not getting big coverage. But voters don’t see it … or they’re only starting to see it in drips and drabs. natesilver: It’s different to cooperate/collude behind the scenes and to do so explicitly. The latter is not something voters will have a lot of experience with. But I’m not even sure I disagree with you, Harry, particularly given that high-risk strategies are probably necessary at this point. I just think the rollout seems a bit clumsy. We haven’t seen Cruz or Kasich take very much time to make the moral case against Trump or explain why Trump should rightfully be denied the nomination if he wins only a plurality. They haven’t set the stage for this all that well. clare.malone: Hm. I think I disagree that they haven’t made a moral case against Trump. Also, there’s something implicit in their banding together that says “moral case,” right? It’s an unholy alliance to beat an unholy terror of a candidate. natesilver: If they’re making the case, Clare, I don’t think voters are hearing a lot about it, in part because the media rarely pays attention to Cruz or Kasich unless they do something this drastic. To take some fairly basic points, GOP voters are still convinced that Trump is the most electable candidate even though that’s, uhhhh, really really wrong if you look at the polls. And as I pointed out in my piece this weekend, the media has often failed to distinguish between Trump having a plurality of support and Trump having a majority, even though that’s super important to the moral case too. clare.malone: In this case, the well-educated Kasich voter will presumably swallow the fish oil pill and hope it prevents the heart attack to democracy that they think is Donald Trump. micah: So give me your bottom line, everyone: Will this work? harry: I have no idea. I think it will, but let’s be real: None of us know. micah: I don’t think it will. harry: So, essentially, you are saying that Trump is the Republican nominee? natesilver: I think you’re asking slightly the wrong question. Did Trump’s probability of being the nominee increase or decrease as a result of this? micah: Push. Helps his message, helps his opponents — my prior is that those two things cancel out. But as Harry says, I really have no idea. natesilver: Betting markets had Trump’s percentage of winning the nomination dropping by a couple of percentage points, for what it’s worth. harry: It decreases the chance in my opinion. clare.malone: I agree that it decreases the chances of his nomination. harry: Well, they should have done something a month ago. And reporting from The New York Times indicates that John Weaver (Kasich’s chief strategist) wanted to do something a while ago. It was apparently Jeff Roe (Cruz’s campaign manager) who resisted. I find that ironic because #NeverTrump has been very anti-Kasich. In fact, Kasich was more anti-Trump than given credit for. natesilver: Yeah, that is interesting, although arguably Kasich should have pursued this strategy without any concessions from Cruz! clare.malone: I dunno — a lot of people might have thought it too mafioso at that point? Splitting up three states is quite a thing. But perhaps I’m wrong and voters who would be so inclined as to go strategic might recognize and respond to the desperation of the historical moment for the GOP, no matter what the calendar date. natesilver: If Kasich’s goal is to maximize the chance of a contested convention, which means minimizing the number of Trump delegates, he should have pulled out of Indiana or Wisconsin of his own volition. Then again, he proved to be a pretty cheap date. Oregon and New Mexico are extremely proportional, and this deal won’t swing very many delegates there. harry: Perhaps so, though I think we underplay the effect giving up on states may have in terms of a candidate looking viable overall. That’s why Cruz didn’t want to drop out of the Northeast contests. natesilver: Having been on the skeptical side about the way the deal was rolled out — and, yes, for the record, I do think it was better for #NeverTrump than nothing — let me say one thing in its favor: It does set Indiana up as something of a #NeverTrump referendum. And Indiana is probably a slightly below-average state for Trump, so it’s not such a bad place to have such a referendum. If Trump loses Indiana, the narrative might start to grok that Trump doesn’t really have a majority of support and is only winning because of the divided field. clare.malone: John Kasich: The underdog story no one wanted. harry: Kasich wasn’t and isn’t dropping out. On the question of whether we’ve had a situation like this before — I don’t think so — a multicandidate field this late in the season in which the leader had only a plurality of the vote and a plurality of delegates, with his opponents having a clear shot to stop him if there was an ability to coordinate efforts. natesilver: We’re definitely in uncharted territory. I suppose the best defense of this is something like the one McCain used in picking Sarah Palin: You may as well shake things up because on various levels the status quo isn’t working. As a bonus, maybe it’ll rattle Trump, who had been unusually calm over the past couple of weeks. On the flip side, two weeks ago it looked like Cruz could probably win Indiana on his own and that California was a tossup. So the fact that this deal was made is a sign of how much Trump’s position has improved. clare.malone: Feels a bit like trying to put the brakes on the “Snowpiercer” train hurtling at like 1,000 mph, though — might just be too late.